The summer is ahead of us, and both inland and coastal Norway have a lot to offer in exciting activities for those who can’t sit down. Whether you’re looking for high speed, a breathtaking view, or to catch your own food; here are seven ideas for sporty adventures in Norway this summer. The skiing season is not by any means over, even if temperatures reach 20 degrees and the sun almost never sets. You can take your family skiing throughout the summer, either at Fonna Ski Centre near the glacier Folgefonna, in the heart of Hardanger, or at Stryn Sommerski at the glacier Tystigbreen. Put your cross country or downhill skiing skills to the test, and be sure to remember your sun lotion, sun glasses, shorts or bikini. In recent years, the form of mountain climbing termed Via Ferrata (Italian for “iron road”) has taken Norwegian travellers by storm. Accompanied by licensed guides you climb steep mountains following a protected climbing route wearing a safety harness and a helmet. A number of destinations in Norway offer Via Ferrata, including Tyssedal, Hemsedal and Loen – to name only a few. Look forward to an “airy” experience with a great view. Read more about climbing in Norway. Throw yourself into one of the many Norwegian rapids in an inflatable raft to experience an adrenaline rush you probably can&apos;t get anywhere else. The Sjoa River offers perhaps the most famous rafting in Norway, but the alternatives are many. You’ll find family-friendly trips in calmer rapids, as well as rivers that require you to have a certain degree of technical expertise. The rafting organisers provide necessary safety equipment, but it is highly recommended that you bring some warm, woolly underwear, a sweater and an extra pair of socks for afterwards. Read more about rafting in Norway. You’ll find innumerable fishing sites in both freshwater and at sea all over the country, and if you get hooked on fishing you’ll find it hard to quit. The best time to catch freshwater fish vary in different regions, but in general they say the season starts in May and ends late autumn. You’ll need a licence for freshwater fishing in most rivers, lakes and streams. Licences are limited to a specific area and period and are often issued by local stores, or they can be purchased online at inatur.no or fefo.no for fishing in Finnmark. In addition, anyone over 16 years of age who wants to catch salmon, sea trout or arctic char have to pay a fishing fee either at miljodirektoratet.no or at a Norwegian post office after arrival. Read more about fishing in Norway. Throughout Norway a large number of accessible underground caves and tunnels can be found, ready for you to explore. The caves vary greatly, from the fantastic shades of blue underneath the Nigardsbreen glacier to the artistic stalactite formation in the caves just outside Bodø. Norway offers caving experiences suitable for both families and thrill-seeking explorers. With a coastline of 20 000 kilometres and a countless number of lakes and rivers it’s no wonder that Norway is an eldorado for kayak enthusiasts. Not only does kayaking allow you to reach otherwise inaccessible sites; paddling also brings you closer to nature in an extraordinary way. Olympic gold medalist Eirik Veras Larsen has ranked his ten best places to go kayaking in Norway. On the list, you find Vestfjorden (a part of the Oslofjord), Hidra, and the Helgeland coast – among others. Read more about kayaking in Norway. 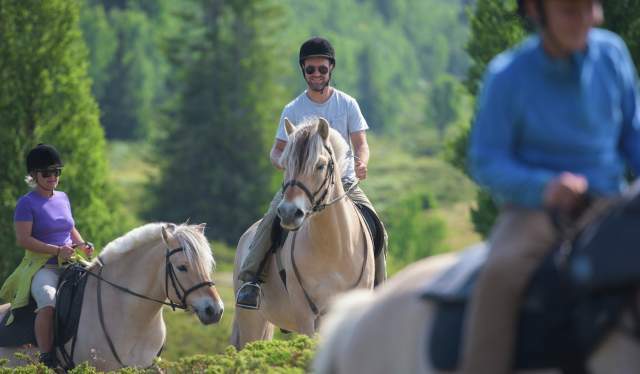 If a horseback adventure in the Norwegian nature is in the top of your bucket list, you’ll find offers that suit your requirements perfectly, no matter your level of expertise (or lack thereof). You can choose from organised horsebacking tours, varying from a couple of hours up to a week. Advanced riders can also rent a horse and go for a ride on their own. Read more about horseback riding in Norway.